Well, after I posted yesterday, that I have always called those potatoes,"Potatoes Anna" I decided to Google it and see if they really are called by that name. I found out that Potatoes Anna are a classic French dish of sliced, layered potatoes cooked in a very large amount of melted butter. (Thanks Wikipedia) Well, my mama always made them sliced as a whole potato. SO much prettier, I think. I used regular baking potatoes. Scrub 'em real good since you are eating the skin. All you need is a sharp knife, a cutting board, and a bunch of clean potatoes. Easy peasy. Slice each potato in 1/4-1/8 inch slices (sorry, no metric here.) and really, I didn't use a ruler, just eyeball it. But DON'T slice all the way down if you can help it. You want to retain the potato shape. Use as many potatoes as you will eat. I figure on one potato per person, except that my boys will eat 2 each. So, I should just go ahead and make the whole 5 pound bag. Once you have them all sliced, place them in an oiled baking dish. 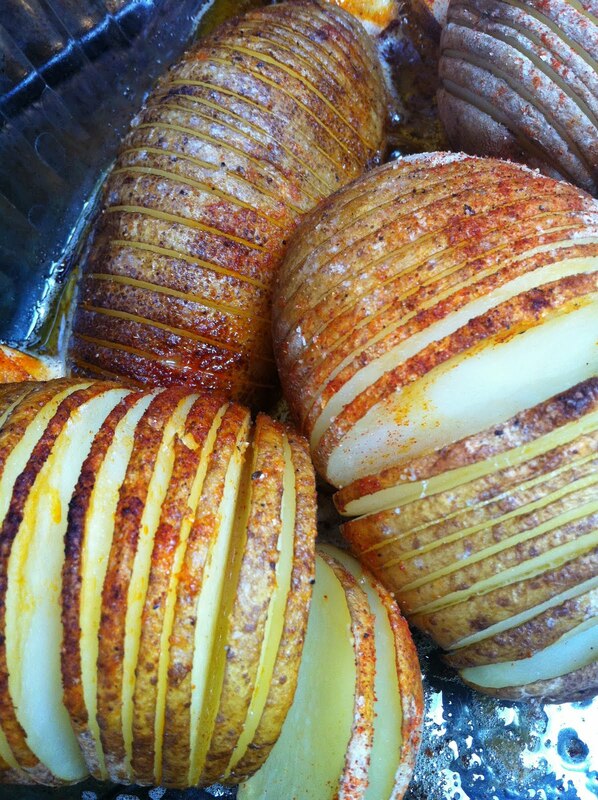 I sprinkled the potatoes generously with salt, pepper, garlic powder, and paprika. I cut up a few slices of butter and stuck them randomly in a between a few potatoes here and there. Crank up the oven to 400 degrees (F) and bake the potatoes for a good 45-60 minutes. Treat them like a baked potato. The longer you bake them, the crispier and better they will taste. I just love crunchy potatoes. 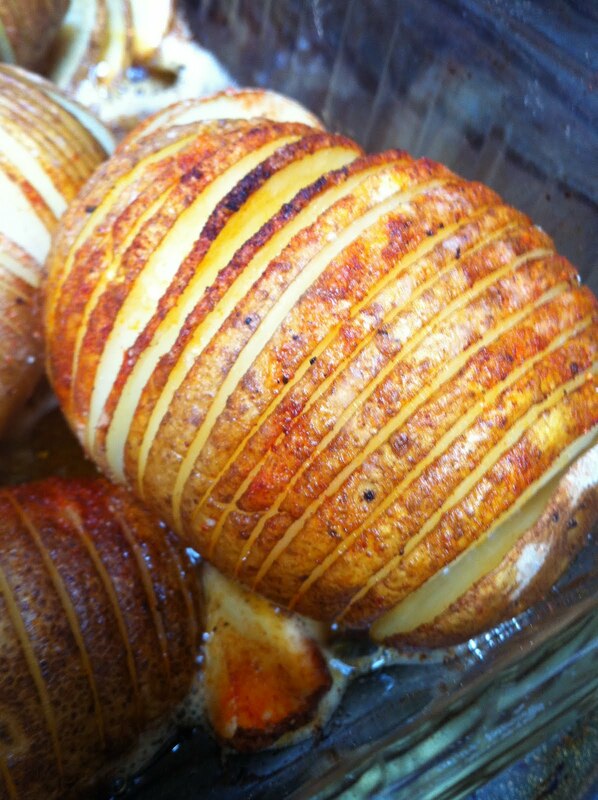 Slice each potato in 1/4-1/8 inch slices to the bottom, but not cutting all the way through. Season to taste. Place small wedges of butter randomly between potato slices. 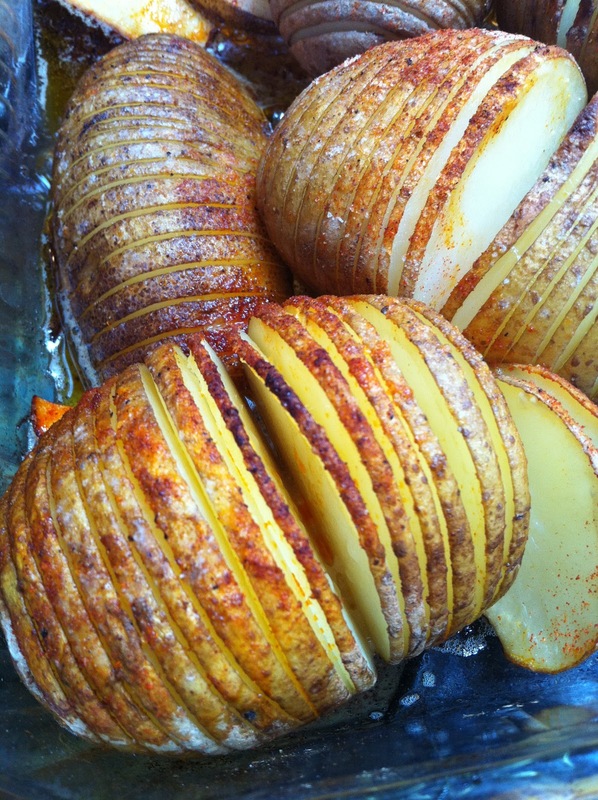 Place potatoes in the baking dish and bake for 45-60 minutes till brown and crispy. Oh What to Make for Easter?